Click Here to Go Back To Part 1! I want to prefece this part of my blog by saying that it’s a little long. I tried editing it down, but there’s too much I want to say that I don’t want to take out. So heads up! Additionally, I worry that I come across as a little dramatic at times. That being said, the thoughts and feelings I describe are a genuine reaction to a what I feel is a dramatic sight, and it would be a diservice to both you and me if I tried to disguise that. So without further ado, here’s part two! While I haven’t had an opportunity to see much of the city outside the airport, the Magic Bus office, my hotel and what I could spot from the back seat of a taxi, it’s been eye-opening none the less. Mumbai is a city of fierce contrasts. Old and new, rich and poor, Urban and suburban. While this is no different than most cities around the world, these differences are much starker than anywhere I’ve ever been: Private jets lined up on the other side of a fence from a slum at Mumbai Airport, ultra-modern skyscrapers towering over crumbling colonial buildings, autorickshaws and Mercedes-Benz’s jostling for position on the roads. It’s all a firm reminder that India is in a state of flux, one of the fastest growing economies in the world, soon to become a powerhouse on the world stage, but still a developing country, where millions are being left behind by this rapid growth. Much of the afternoon of Day 1 was spent at Magic Bus’ head office, a chance to catch up with colleagues who I had met in the UK, and to properly meet those colleagues I’ve only known through our exchanges by email. Everyone has been very friendly and welcoming (of course they have! They work for Magic Bus!) and it’s been a great opportunity to learn about some of the important behind-the-scenes work that makes Magic Bus a success. It’s also been a chance to get up to speed on Magic Bus’ plans for the future. I won’t give anything away here, but I will say is that it’s all very exciting and will help Magic Bus continue to make a positive impact! Today was the first of two community visits I have planned while I’m in Mumbai. Escorted by the lovely Aarti from Magic Bus head office, we travelled by autorickshaw to the small community of Chamunda Nagar in Bhandup, North East Mumbai. This tiny community is made up of around 200 people, primarily Buddhists and members of one of India’s lower castes. The area in which they live is tightly packed, sandwiched between a canal, a main road and a busy railway line. Most of the buildings, primarily homes, but also a couple of shops and a small Buddhist temple, are non-permanent, largely built from tarpaulin, wood and sheet metal. Some are lucky enough to have a door, most make do with a sheet of cloth or tarpaulin for privacy. 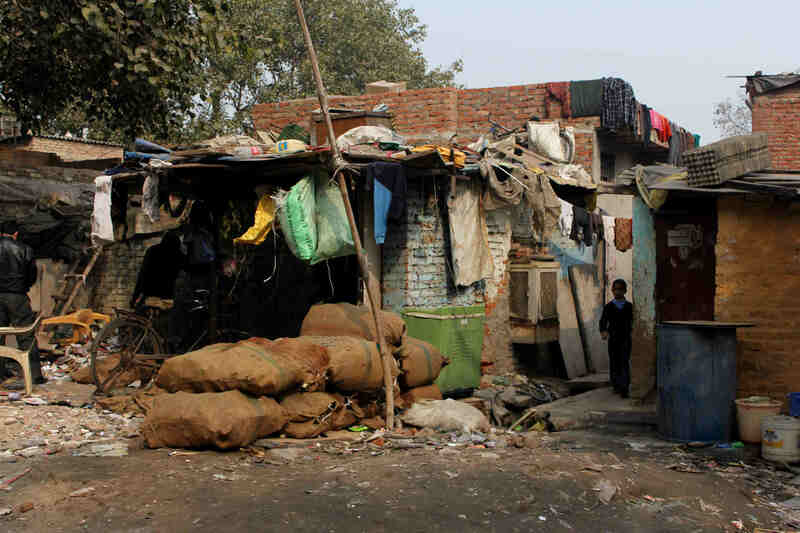 None of the homes have access to running water, let alone any toilets. Clean water for the community is accessed from two taps, which work for only two hours each day because they can’t afford to pay for a regular supply. The only other source of water is the canal, which is filled with rubbish and into which pours raw sewage from an outlet pipe less than 10 yards from the clean water taps. 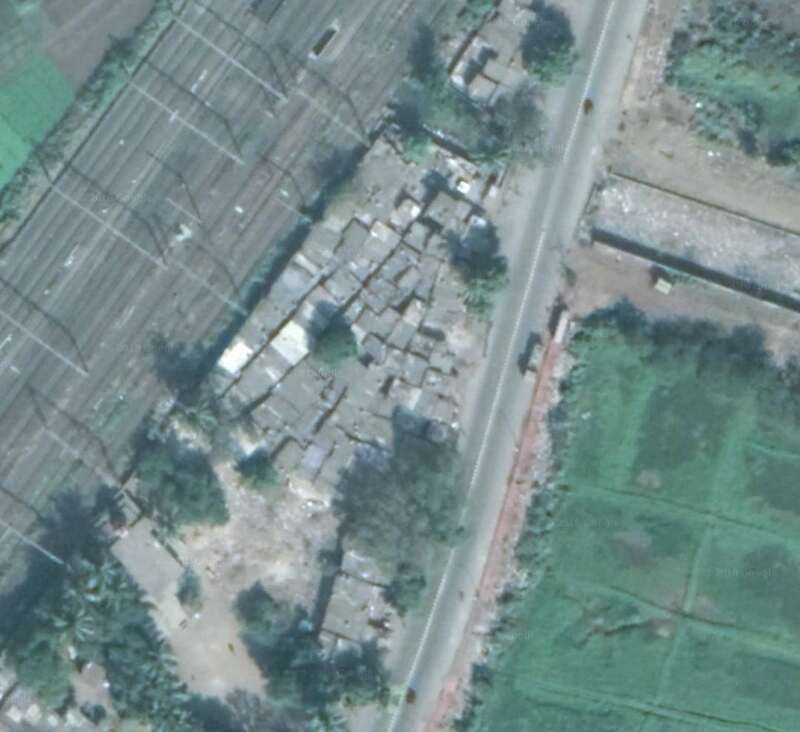 A satellite photo of Chamunda Nagar. You can see the town square in the bottom-left corner and the canal in top-middle of the image. The Magic Bus sessions are held in the green fields across the main road. Click to Expand. While this isn’t a photo of Chamunda Nagar, I’ve included it here to help you imagine it, as this is an excellent representation of what the community is like. Click to Expand. Each day the women of the community gather with an assortment of containers to collect the water their family needs to survive that day. The men are generally day-labourers working for the local government, earning a meagre sum. It was during this two-hour slot that Aarti and I arrived, with women and children gathering as much water as possible before the taps stopped. 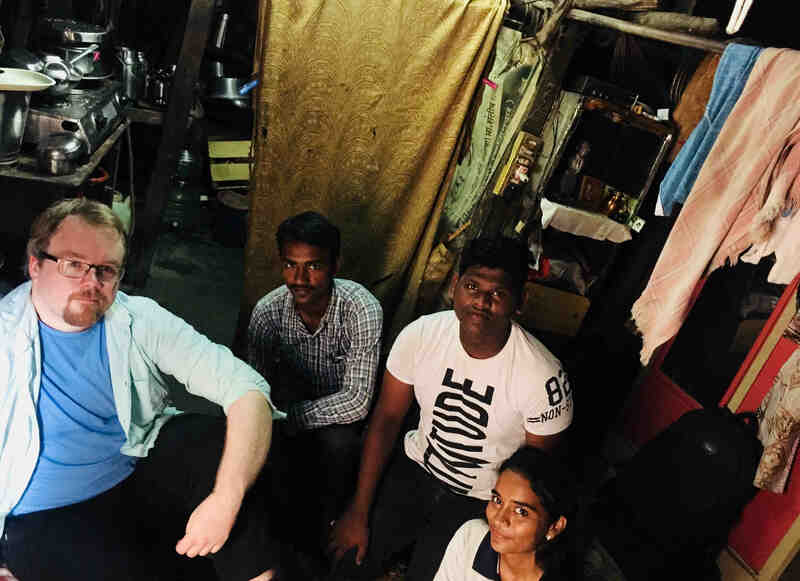 We were met by Sonali, the Training and Monitoring Officer (TMO) for the area, Ashit, a Community Youth Leader (CYL), and their friend Akshay, an informal volunteer. For those that don’t know, Magic Bus CYLs are young people who run the Magic Bus sessions and serve as mentors and role models for their community. The TMO’s are the managers of the CYLs, providing training, and gathering the data for each Magic Bus session. We took a walk through Chamunda Nagar, a community so small that it took only around 10 minutes to complete a circuit. On one end are the aforementioned taps, the other is essentially a town square, a small open space that serves as a focal point of the community. In between, the buildings are tightly packed, with little more than a shoulder width of space between structures to serve as streets. Rubbish lies everywhere, animals roam free and there’s no escape from the flies and mosquitoes. Sonali explains that open defecation is commonplace (which I luckily did not have to witness) as the only toilets for the community were some clunky portable ones on the other side of the busy main road, which are apparently so poorly maintained, no one risks visiting them. As we visited the fresh water taps on the far side of Chamunda Nagar, Akshay showed me the canal and the open sewer pipe just yards away. The water, largely hidden underneath floating rubbish, had been turned grey by the sewage flowing into it, with a putrid smell of something rotting. I’m trying to imagine being put in a position where I and the 200 that living nearest to me only had access to clean water for less than two hours a day. If I didn’t get enough water in the morning and ran out, I would be forced to choose between enduring +30Co heat without water, or to drink stinking, polluted sewer water from who knows where (there have been efforts to trace where the sewage is coming from, but with no success). From the comfort of my desk in an air-conditioned office, bottled water at hand, this feels like an impossible scenario that this community faces every single day. To think that most of us in the UK only have to worry about the occasional hosepipe ban puts things in very sharp perspective! Personal hygiene is obviously limited. With only so much water available, needed for drinking and cooking, basic acts of personal hygiene like washing hands is forgotten. Having completed a circuit of Chamunda Nagar, Akshay very kindly invited us into his home, giving us an opportunity to chat (with Aarti as interpreter. Sonali, Akshay and Ashit only speak Hindi and I, obviously, only speak English.) His house, like most of the others, is largely assembled from tarpaulin and sheet metal. It has no windows to allow in light, and the black tarpaulin walls only amplified the already stifling heat. The house is divided in two with a cooking area and a living area and no evidence of a bed. Akshay doesn’t have that many possessions, but he clearly does his best to keep everything tidy and orderly. From Left to Right: Myself, Akshay, Ashit & Sonali. If you think I’m looking a bit warm in this photo, you’d be right! Thank you Aarti for taking the photo! I’m now writing this a day later and I’m still struggling to process everything I saw at Chamunda Nagar. Whenever I read about other people’s experiences on these types of visits, generally the term “Shocked” or “Surprised” comes up. I’ll be honest, having worked at Magic Bus for a few years now, read the stories, seen the photos, watched the films etc., I had a good idea what I was going to see. But to stand there in this slum community surrounded by the sights, sounds and smells, my reaction both as I stood there and as I write this now, is anger. Anger that anybody should be forced to live in these conditions every day. Anger that a community of 200 people only get 2 hours of water access a day, their only alternative being raw sewage. Anger that the local government has at best chosen to ignore this community because of its legal status. Anger at myself for taking for granted all the things that fill my basic needs that this community, through no fault of their own, must suffer without. In the short time I was there I saw genuine examples of kindness and friendship; that these people, little different from me when push comes to shove, have no choice but to live in these inhumane conditions infuriates me to my very core. But there is hope that tempers my anger. The work that Magic Bus is doing there, with around 50 kids, 30 boys and 20 girls, aged 12 to 18, is already having an impact. Before Magic Bus arrived a year ago, none of the children in the community went to school. They didn’t see the point. Now they all go to school, they even make sure to do their homework! Better yet, all of them aspire to something better. They’re just like kids back home when you ask them what they want to do when they grow up: “Scientist! Doctor! Train Driver!” And just like kids at home, their aspirations change every day. But the fact that these children have aspirations at all and are not scared to chase a better the future, in this place where hope would otherwise die, is truly amazing! Sonali, Akshay and Ashit are perfect representations of this fact. The three of them, between the ages of 18 and 21, are firmly committed to doing whatever they can to improving Chamunda Nagar and improving the lives of the children that live there. They all have aspirations too. Sonali is preparing for her government exams, so she can become the kind of officialnthat can bring sweeping change to communities like Chamunda Nagsr. Ashit wants to become a policeman just like his Grandad. Akshay wants to become a social worker, so he can best help his community and continue the work he does with Magic Bus. The three of them are incredibly bright and deserve so much more than what they have. But I’m sure that with the determination and commitment I saw in them, and the support of Magic Bus, Sonali, Akshay and Ashit have a good future ahead of them. So, for all my anger at what the people of Chamunda Nagar have to endure, I also feel a great deal of hope. With the Magic Bus programme and young people like Sonali, Akshay and Ashit leading the way, I am confident when I say that the future of the children of Chamunda Nagar is bright.